SEBRING, Fla. (March 18, 2018) – Until the final pit stop of the 66th Mobil 1 12 Hours of Sebring, the No. 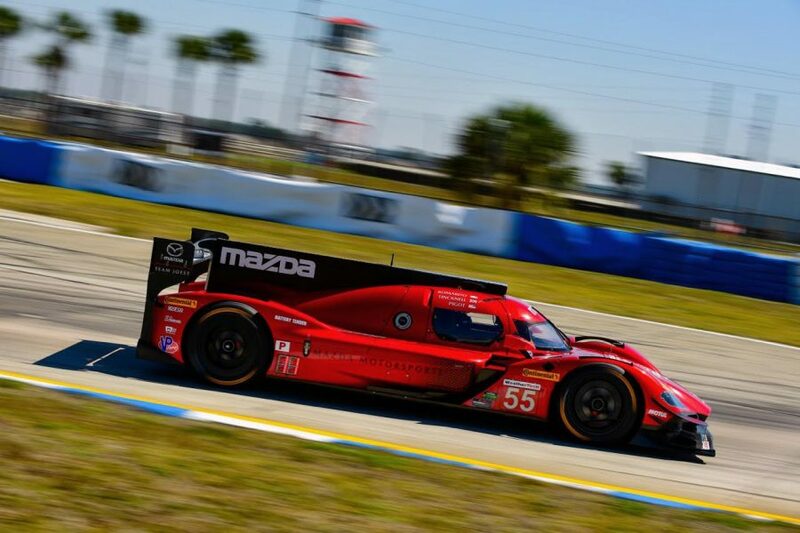 55 Mazda RT24-P driven by Jonathan Bomarito, Spencer Pigot and Harry Tincknell was closing in on a potential victory at the famed circuit. After leading the race for 58 laps and contending for victory throughout the day, the car would encounter an electric issue that prevented it from quickly starting at the final pit stop. Once it did start, the car finished the race in sixth position. The pair of Mazdas had shown winning potential earlier in the race when they ran first and second in the second hour of the race. After the No. 77 Castrol/ModSpace Mazda RT24-P was slowed in the fourth hour with a braking issue, the no. 55 Mazda RT24-P would contend for the victory throughout the rest of the race. Olivier Jarvis set the fastest lap of the race and track record for IMSA’s Prototype class in the no. 77 Castrol/ModSpace Mazda RT24-P with a time of 1:49.002 around the 3.74-mile Sebring International Raceway circuit. The car, which he shared with Rene Rast and Tristan Nunez, finished the race in eighth position. The next round of the IMSA WeatherTech SportsCar Championship will be the Bubba Burger Sports Car Grand Prix at the Toyota Grand Prix of Long Beach on April 13-14.